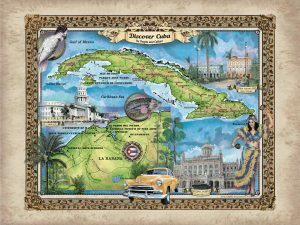 Our Travel Tuesday Feature Map: Discover Cuba– Maps made by US! Use discount code CUBA to receive 50% off your next order! This Caribbean Island nation sits between the Caribbean Sea and the North Atlantic Ocean, and is 150km south of Key West, Florida. In its historic, artistic, cultural, and geographic context, Cuba is a vibrant and fascinating place with attractions that defines the identity of Cuba and its people. Its landscape features scattered rugged mountain ranges, lush forests, fertile valleys of covered tobacco fields, and rolling limestone plains sprinkled with beautiful tropical trees and varying vegetation. With a wealth of architectural diversity, historic preservation efforts have kept these glorious, beautifully designed buildings in tack. Cuba is not simply another geographic location; its culture, history, heritage, art, and so much more. Cuba’s distinctive characteristics, including its contemporary changes, make it a dream destination for travelers. In Cuba’s capital city of Havana, travelers can expect to see a city that is seemingly trapped in time with glimpses of colonial-era reconstruction, which is a clear indicator of how the city has transformed since Spanish colonial time. History remains in the paved streets such as Paseo del Prado and cobbled plazas of Habana Vieja (Old Havana), surrounded by Spanish Andalusian architecture. This is evident in some of the finest Cuban baroque style buildings, including the Cathedral of Havana and the Gran Teatro de la Habana (the Great Theater of Havana) among others. Some of the buildings in Havana dates back to the late 1700s, and Plaza de Armas, for example, have a strong colonial appeal. Havana also boasts fascinating museums (National Museum of Fine Arts), historic forts, captivating nightlife, and vibrant public squares. History seems unending in Cuba, and in its eastern region of Santiago de Cuba, the city with the most Afro-Cuban influence, and birthplace of the independence and revolutionary movements, is a rich cultural hub where literature, musical tradition, architecture, politics, and a colorful combination of people from different ethnic groups abound. Theater comes alive in the city at Cuba’s second largest theater, Teatro Heredia, designed by Cuban architect Antonio Quintana. The city puts on the most spectacular carnival in July, where music, dance, and an explosion of colors are blended to remember history, community, and culture. In the northeastern region, culture of a different kind can be found in Baracoa, the country’s oldest settlement. Geographically isolated, the unspoiled township features secluded beaches, untamed rainforest, farming communities, and beautiful architecture evident in the 19th century houses and colonial fortifications such as Matachin Fort and La Punta Fort. There is a multitude of things to experience in Cuba, from the history that lives on in its architecture to its vibrant music. Your journey to Cuba will leave you fully entertained and educated.